It's been another year of bloodletting in the music industry. CD sales continue to decline. Brick-and-mortar record stores are rapidly losing business. Major labels now live in fear of being supplanted by computer companies. Artists are faced with the quandary of whether or not to keep putting out albums in the face of lessening demand. Still, many of us still cling to the old "plug-and-play" experience, even if it's become a form of nostalgia rather than a practical way of listening to music. Product developers from the Milpitas-based electronics company, SanDisk, insist that there's still a place for packaging and liner notes in the era of digital downloads. Their solution? 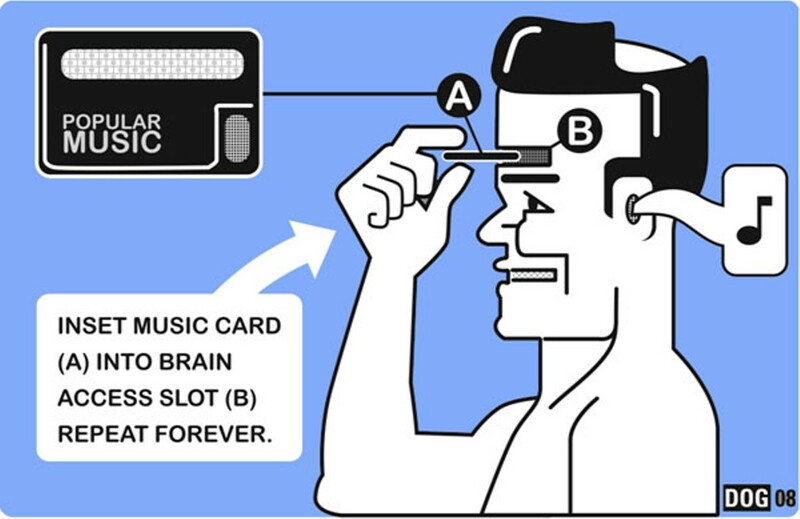 It's called slotMusic, a tiny microSD card (about the size of your smallest fingernail) with a 1 gigabyte storing capacity — enough space for a full album, liner notes, and even music videos. It comes with a USB adaptor so you can put it in just about any computer and upload all the content, and it plugs directly into many cell phones with multimedia capabilities. Supposedly, these tiny little chips are to regular CDs what the DVD is to the VHS tape: a slicker, aesthetically improved form with scads of extra content, offered at roughly the same price (slotMusic cards retail for about $14.99). Not to mention SansDisk gives you the illusion of buying something tangible: Slot cards come in a rather bulky package that's about the size of a standard CD, so theoretically, you could shelve them alongside the rest of your CD collection. Russ Eisenman, the former head of marketing for Tower Records and current marketing director for SanDisk, thinks the new cards straddle both sides of the fence, offering the instant gratification of digital while recouping an old "Walkman style" that never quite went away. "Now songs and single sales are growing faster than album sales," Eisenman said. "The artist is really in this position now of, 'How do I take all this stuff that I create on my album and sell it as a project?'" He thinks slotMusic may revolutionize the music industry all over again. But some music journalists and product reviewers believe it's just a gimmick. "It is an attempt by SanDisk to sell more mini cards and players, and by the music industry to find a physical format that people might pay for," said Bruce Houghton, who runs the music and technology blog, Hypebot.com. "Ultimately, it is a gimmick that will almost certainly fail." "I don't know, I find this to be unbelievably cute," commented user "derX" in response to a product review on Engadget.com, which bore the subtle headline, "SanDisk's slotMusic albums and $20 Player now ready to be ignored." "This has got to be the cutest piece of FAIL ever mass marketed," derX continued. "If I saw a stray one on the street, I'd take it home and name it Fido." Yet Eisenman insists that slotMusic makes good on its marketing slogan, "beyond music," because it outpaces traditional CDs in terms of space and capacity. He noted that artists who wanted to go beyond what could fit on a regular CD once had to release a double album, which increased the price. Moreover, slotMusic MP3 files offer better sound quality than most digital downloads (322 kilobytes per second versus the usual 128). Eisenman compares it to buying a download at retail. "We want to make an easier listening experience rather than a technologically challenging experience," he said. The concept of bonus content — while compelling — will likely be delivered through other channels, says Houghton. "You can already add extra content to CD and some kinds can be added to downloads," he said. "Apple is also experimenting with a system that will deliver bonus content to iPhones. You'll see more and more bonus content in 2009, but it won't be via SanDisk." Nonetheless, the industry appears to be giving it a go. This year slotMusic launched partnerships with the four major record labels (Warner Brothers, EMI, Universal, and Sony BMG) as well as retail chains Best Buy and Wal-Mart. It has also signed on sixty pop artists to pimp out the new product. Within the last month, a spate of slotMusic albums were released from such artists as Lady Gaga, All-American Rejects, Fall Out Boy, T-Pain, and Akon, whose new album, Freedom, arrived in slotMusic form two weeks ago. It includes an interminable, rambling documentary in which Akon shows us his record collection, his old 'hood, the high school from which he got expelled, and finally, the studio where it all happens. Then there's the complete thirteen-track album, several high-res photos of Akon, and a music video for the single "Right Now," which opens with a shot of Akon sliding his slotMusic card into his cell phone. So, is anybody buying them? Marc Owens, a manager at Best Buy in Pleasant Hill, said that some people are already informed about the new "pre-loaded cards," though he didn't specify whether or not people are actually buying them. "I think a lot of people are enamored with the fact that they can get the digital music content without having a PC," said Owens. "It's a simplistic format that is accessible to everybody. You know?" However, without the USB adaptor, which enables the songs to be played on any device that plays MP3 files, the cards only work in microSD-enabled MP3 players or cell phones. "I can't see how anyone will care when more than 90 percent of all music players out there don't have microSD card slots," said ExtremeTech.com senior technology analyst Jason Cross. It comes with a USB adaptor so most people would need a computer to operate the thing. SanDisk also recently came out with a new slotMusic player (about $20) to help kick-start the whole phenomenon. But the cards could even end up hurting the record industry. To make them more convenient, they are free of copy protection, which makes the content more vulnerable to illegal file-sharing. In other words, users can simply copy the content onto their computer and share them with friends. Ultimately, most critics seem to believe that slotMusic doesn't offer anything new to the consumer. "I have trouble keeping track of my CDs. I can imagine easily losing an SD card," wrote Lloyd Case, an editor at ExtremeTech.com, in an e-mail. "That's mitigated by the ability to upload them to a PC, but then, why not just buy the music online, then? I think what they really need to do is give away the player free, then sell the music. That might work." Despite all the criticism, Eisenman remains optimistic. He sees slotMusic as a happy middle ground between an antiseptic digital form and an old-school product that's become an anachronism. "What people want when they buy an album at retail, they don't just want the songs, they want the full album-buying experience," said Eisenman. "They want something you can put it back in your CD collection, which will hopefully become your slotMusic collection." It works well, in theory, but slotMusic will have a tough road ahead if it really wants to dethrone the CD and iTunes — much less the Walkman.